Slugthrower: The Firestrike is a conventional gas-operated slugthrower using a gas-piston and a seven lugged rotating bolt assembly, meaning that it does not need any electronics to run. The gas port can be dialed to better work with different propellant charges. Ruggerized: The Firestrike has been unusually ruggerized by incorporating a thick, case-hardened Mirrsteel receiver and barrel. This makes the weapon more difficult to damage under hard battle conditions, and also allows users to use it as an impromptu bludgeoning weapon with little fear of damaging the weapon itself. Oversized Controls: The Firestrike uses larger than normal controls, allowing it to be more easily manipulated by soldiers in heavy armor or larger species such as Houks and Wookiees, and by extension, Arrichit series Synthetic Soldiers. Medium Bore: The Firestrike uses the same 12x50mm Shadowstrike ammunition as the company's Shadowstrike Battle Rifle. This provides the machine gun with good "knockdown" power, especially at close range, along with a reach greater than many blaster rifles. Unfortunately, 12x50mm Shadowstrike also has a noticeable ballistic drop, which can make it difficult to accurately hit precise targets at long ranges. Modular Slugs: As with many other conventional slugthrowers, there is a wide variety of ammunitions available for it, ranging from simple hollow-point ammunition and full metal jacket bullets to exotic explosive tipped rounds and acid-filled bullets. Modular Accoutrements: The Firestrike has a top picatinny rail that allows the machine gun to accept aftermarket scopes and other similar accessories. The barrel shroud and receiver also incorporate modular mounting slots allowing it to accept additional picatinny rails as well as different ways to hold or mount the weapon (ghetto grip, tripod, bipod, etc). Heavy Hitting: The Firestrike packs a heavy punch that is based more on the mass of its projectiles rather than its velocity, which provides it with good knock down power, which can make it deadly even to targets hiding behind light cover such as trees and hastily constructed barricades. Long Range: The Firestrike uses a full-power rifle cartridge, which gives it greater range than most blaster rifles and many other slugthrowers. Modular: The Firestrike, like most slugthrowers, is a relatively adaptable weapon. Not only can it accept different types of ammunition, but it has a top picatinny rail and modular handguard mounting system to allow it to use a variety of off the shelf scopes, sights, and other devices with little to no adaptation by the end user. Heavy: The Firestrike is a big, overbuilt gun which unsurprisingly makes it fairly heavy. Unsurprisingly, most people struggle to move quickly (if at all) while carrying it, and the average human rarely can quickly aim it effectively unless in a stationary position with the weapon either braced or mounted. Slow Reload: Being a belt-fed weapon, the Firestrike takes somewhat longer to load and cycle compared to many magazine fed slugthrowes or energy weapons. Ballistic Curve: The Firestrike's ammunition, 12x50mm Shadowstrike, has a heavy bullet which gives it a noticeably steep ballistic dropoff at longer ranges, which means that it is harder to precisely hit targets at range because most people find it difficult to get the precise angle of elevation necessarily to get accurate hits. The LPD-29 Firestrike is a general purpose machine gun that uses a full rifle power round to effectively provide mobile, saturation fire from range. From the start, the Firestrike was designed as an accompanying piece to the company's LPD-21 Shadowstrike Battle Rifle. Unsurprisingly then, both share the same ammunition to ease on logistics and lower costs. This largely gives both weapons similar ballistic performance, though the Shadowstrike tends to be more accurate while the Firestrike produces a substantially larger volume of fire. But behind these inherent role differences, the Firestrike was also notably designed with some cultural considerations. Most pieces of technology in the galaxy are designed for use by humans. This has largely led other species of different sizes to either modify these weapons for their own use or make to use of their own native designs. With a large wookiee population in areas of the Silver Jedi's influence, Lucerne Personal Defense decided to make the Firestrike for their specific use from the get-go, carving out an untapped market niche in the process. To this end, the Firestrike comes with slightly larger than normal controls, allowing Wookiees and other larger species to use it with little problem out of the box. Most humans can use the Firestrike as is, though the controls usually do feel bulky in their hands. As another consideration towards Wookiee use, LPD made the Firestrike extremely rugged with the idea in mind that could well see use as an impromptu bludgeoning weapon in the hands of an enraged Wookiee. As a side effect, this overbuilding of the weapon has made it noticeably heavier than the typical slugthrower machine gun. While annoying to lug around for most people, this has also helped to reduce the weapon's recoil, especially since 12x50mm Shadowstrike was designed for use in a smaller weapon. By using a relatively heavy bullet weight with a moderate amount of propellant, 12x50mm Shadowstrike hits with a fair amount of momentum, making it well-suited to flying through mid to long ranges before plowing through light cover and concealment into targets. Combined with the Firestrike's high rate of fire, skilled users typically have little trouble cutting down groups of enemies from a distance, though users can find themselves disadvantaged by the rate of fire of many comparable repeating blasters. LPD feels like this is a fair tradeoff for the flexibility in ammunition payloads afforded to slugthrower users. While aftermarket ammunition suppliers can and do supply a wide variety of ammunition in 12x50mm Shadowstrike, Lucerne Personal Defense offers these choices as standard in its catalog for use with the Firestrike for guaranteed reliability. Full Metal Jacket: A simple solid slug of lead or other dense material covered in a thin jacket of copper. This is probably the most common and cheapest ammunition available in 12x50mm Shadowstrike. LPD has been marketing the Firestrike from two different approaches. The first has been selling it alongside the company's Shadowstrike Battle Rifle, where the use of interchangeable ammunition can ease logistics and costs for large organizations. The second has been oriented towards larger aliens such as wookiees who often do not have many factory tailored options available to them. Thanks to its parent's company's connections to the Wookiees it has enjoyed steady sales in the space around Kashyyyk. Lucerne Labs itself also offers it as a default weapon's choice for its Arrichit-series Battle Droids. These marketing approaches have led to steady stream of sales, making it a minor weapon of note in the Kashyyyk region. Material: Beskar blade, various hilt components and materials, other vibroblade components. Tuned Ultrasonic Generator: The Silver Talon series uses a tuned ultrasonic generator that operates in a higher frequency than most other vibroblades making it effectively a silent weapon, much like the Talon Vibrodagger. Dense: Vibroblades in the Silver Talon series are abnormally dense not only because of their beskar blades, but also because of their unusual manufacturing technique which uses ion fusers and pressor fields to make these blades dense than their size suggests. Cultural Variants: The basic Silver Talon series isn't a single vibroblade design, but rather a common construction and size of a series of short, slashing vibroblades. The Silver Talon series has a variety of different factory available aesthetic choices that allow some deviation in blade shape, guards, and hilt materials. Aside from the base model, Silver Talon variants that closely emulate the traditional wookiee Ryyk Blade and the Mandalorian Beskad are quite popular. Silent: Unlike many Vibro weapons, the Silver Talon is typically quiet enough that it is effectively silent to most species' hearing. Durable: The Silver Talon's material composition and dense construction makes it exceptionally durable, capable of withstanding lightsaber strikes for some period of time before breaking down. Short Reach: The Silver Talon is shorter than many other vibroblades and most lightsabers, meaning that foes using those weapons have the potential to be able to hit the Talon's wielder first. 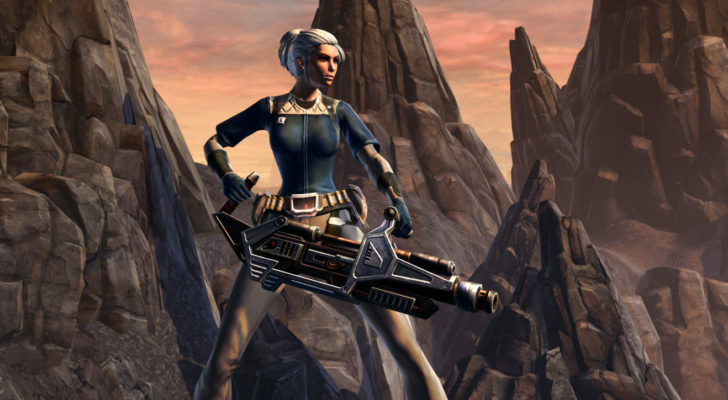 Heavy: The Silver Talon is a heavy weapon for its size, making its use in extended fights better suited for exceptionally fit inidividuals or species like wookiees. While melee weapons have largely given way on the battlefield to blasters and slugthrowers, there are instances where melee weapons still have some importance, such as in close quarters fighting or a need to silently dispose of an opponent. The Silver Talon is designed to meet these ancient needs with a modern take on the old vibroblade. While most private Silver Talon purchases vary somewhat aesthetically from each other, their commonalities far outweigh their differences. Each Silver Talon starts out as a lump of beskar that is then heated and formed by ion fusers into rough shape. While still in this molten state, pressor fields finely shape the blade into its final form via the purchaser's blade shape preference. This process also makes the Silver Talon exceptionally dense for its size. Once properly tempered and cooled, this blade then passes down an assembly line where it is joined to an ultrasonic generator and related components to make it a true vibroblade. This functional weapon then passes down to specialty workshops which specialize in the finalizing the aesthetics of the weapon. A Silver Talon ordered by a wookiee may closely emulate a Ryyk blade through the use of a carved Wroshyr-wood hilt covered in leather. Another might closely follow the lines of a mandalorian Beskad or another military martial tradition. Some Silver Talons are even shipped at this stage to small workshops and artists who transform them into extravagant if highly functional dress swords for military officers and government officials. But despite these ornamental differences, their practical performance in the field is indistinguishable. The short, curved blade shape of the Silver Talon is optimized for slashing and especially hacking attacks, particularly in close confines. Because of that design choice, it is particularly effective in close quarters combat or when hacking way through foliage and other obstacles. Unfortunately, it also makes it a poor thrusting weapon, which in practical terms means that other sword users frequently can outrange their Silver Talon wielding opponents. Like other vibroweapons, the Silver Talon is exceptionally sharp with the ultrasonic generator on,and it can easily tear through most common clothing and many light armor materials in a single stroke. Because of the weapon's dense durability, some users have been used it to hack down small trees in several strokes or through hull plating and doors by 'grinding it' against those objects, though frequently doing this will cause the blade to lose its edge much more quickly than normal. Some owners also like to use it as a 'stealth' weapon because it is inaudible to most species' hearing ranges. Most Silver Talon purchases so far have been relatively small orders on their own, with most being individual, customized purchases. But a number of militaries have made small orders, typically as dress swords for officers or ceremonial weapons for guards. Despite this purchase trend though, there have been consistent purchases by military units based on Kashyyyk and other wookiee colony worlds for plain weapons with no finished hilt. It is currently thought that wookiee warriors on these worlds prefer to put the final finishing touches on these weapons themselves. Aside from these purchases, a large number of these weapons have been placed in package deals with Arrichit series Synthetic Soldiers, where these blades are often used in place of Ryyk blades as back-up weapons to bowcasters and other heavy ranged weaponry. Defended: The Alpheus is a durable vessel, using an Ossis Starship frame which is laminated with beskar, then covered in moderately thick Argentum-seris Matrix Armor. This basic form is then augmented by two separate networks of twin shield generators as well as the Aegis II Anti-Concussion Field Generator network and a supplemental Phalanx-class Shield System. Small Craft Swarm: As a battle carrier, the Alpheus can carry swarms of starfighters and support craft into battle. Operations Center: The Alpheus harkens back somewhat to the older Imperial Star Destroyers, carrying an extensive amount of troops and support craft in order to support dedicated ground operations. As part of this, the Alpheus also sports a dedicated command complex derived from the Union-class Assault Carrier. Light Weapons: The Alpheus is fairly light armed for its size, sporting an armament more appropriate for ship that is perhaps a fifth of its size. This means that this armament is typically equivalent to that found on a cruiser, and some smaller vessels such as star destroyers may pack more firepower than this vessel. High Sensor Signature: The Alpheus has an usually high sensor signature, largely due to its increased defenses. The Beskar-laminated frame makes FST returns much more prominent, and the ship's layered shield technology produces a higher energy signature than normal. Low Maneuverability: The durable frame is also responsible for making the Alpheus more front heavy, which in practical terms usually results in reduced maneuverability. Description: As the Silver Jedi's influence expanded closer to the Galactic Core, rumors reached the ears of Admiral Quee that a new embodiment of the Galactic Empire was forming in that same area. Sensing the possibility for conflict between the groups, Admiral Quee directed Lucerne Labs to design and construct a small number of massive assault carriers that could carry dozens of starfighter squadrons and thousands of troopers and battle droids to meet this new threat. The resulting Alpheus-class Assault Carrier met Quee's requirements with the characteristic organic lines and legendary durability of classical mon calamari cruisers. Despite its external appearance, however, the inside of the assault carrier is clearly a Lucerne Labs product through and through, sporting many refined subsystems concealed by carefully thought out layers of advanced materials. Because of their size and consequent expense, only a handful of these impressive vessels have been commissioned into the Silver Navy. Crew & Automation: The Alpheus has a typical crew for its size, though like many other Lucerne Labs warships, it can run on a much smaller crew if necessary thanks to a network of Calor Bio-computers and Biolux Organoform Circuitry. This automation cannot only assist the crew in their tasks and automate some basic day to day functions, but it can also act as emergency back-up control for critical systems. This allows the systems of the ship to function even without a full crew, though at the cost of less efficiency and effectiveness. Because a large number of the Silver Jedi and ISAF forces are composed of droids, the Alpheus has a large number of droid power charging stations and maintenance facilities in order to effectively keep this mechanical force running. The Alpheus has a typical Lucerne Labs CIC-style bridge located near the center of the ship, but it also has a pair of supplementary command stations dedicated to running teams of smaller space and ground forces respectively: the SOC and POC. The SOC, also known as the “wishing well”, is a tactical command post loosely based on the bridge of the old Inexpungnable-class. It is circular room with two vertical levels, with the inner level being substantially lower than the outer ring. The outer ring holds typical computer consoles, comscans, and a handful of small scale holo-tanks. But the central portion is created with a transparisteel deck and walls through which embedded holo-projectors could recreate the space around them and the objects, both artificial and natural, on a large scale that is not only detailed and immersive, but also in real-time. Such a presentation affords the crew manning it perhaps the easiest method to observe and interpret on a large scale while avoiding being sucked into observing the battle through a handful of 'keyholes' viewpoints, such as the bridge viewport or an several electro-photoreceptors. Commanders and flight controllers often use it to help coordinate groups of ships, particularly starfighter squadrons and corvettes for quick, surgical strikes. The Planetary Operations Center(POC) is located a short distance away from both the main bridge and the SOC. This is a rectangular room whose walls are mostly covered in LCD screens which frequently display live feeds from cameras and other visual sensors found on personal armors, droids, vehicles, and other like devices. Most of the room is occupied with neat rows of computer consoles and holographic tactical battlefield displays needed to interpret the vast amount of data flows through the center and coordinate the units present on the ground. Many of these consoles are equipped with CL-3 headsets to help control and coordinate droids and other automated units. This room also contains a CS-Mark 12 Holo-projector, used to plan large-scale movements, and a pair of CS-Mark 10 Command Combat Simulators, which are used to analyze terrain and simulate battle plans. Commanders typically use the POC as a mobile command post for a large variety of units and missions, from monitoring strike teams through helmet cams to directing armies thousands of individuals strong into battle. Communications: The Alpheus uses a quartet of Oracle-class Communications Packages supplemented by several hundred comm lasers and a pair of Biocomms. This provides the ship with an excellent amount of bandwidth that allows it to effectively coordinate its carried forces even if they are deployed at an extended distance. Command with its command control facilities, the Apheus is capable of acting as the command ship for some truly massive operations such as mass civilian evacuations and planetary assaults. Hull: Like many of Lucerne Labs' recent designs, the Alpheus has been shaped primarily by mon calamari shipwrights originally from Hast, which shows in their characteristic fluid, almost aquatic design style. But despite that appearance, the Alpheus uses an Ossis Starship Frame which has been laminated with mol-welded beskar for extra reinforcement. This primary frame is then covered in secondary armor belt of link-steel laminated with plasteel to provide some flex in absorbing and dispersing physical impacts. This secondary belt also acts as a rudimentary farraday cage to help protect the vessel from electromagnetic radiation, whether it is naturally occurring or as part of an enemy attack. This armor belt is then in covered in a primary belt of Argentum Matrix Armor, which is designed to better mitigate the effects of heavier weapons that can pierce through the ship's double-layered shields. Some vital sections of the ship, such the bridge and engineering sections, are shielded with Agrinicrete to provide protection against unusually strong radiation that may get past the ship's shields and hull. Hyperdrive: The Alpheus is equipped with a x1.5 hyperdrive, giving it relatively average performance for its size. With the prevalence of interdictor technology, this hyperdrive has been hooked up to multiple hyperspace coils to form a HIMS device, allowing it to better penetrate extensive interdiction efforts. Security: The Alpheus incorporates conventional Lucerne Labs internal security systems, making extensive use of code cylinders and droid-specific passcodes to control sensitive access to the ship and its systems. Tripping or attempting to force one's way into the system can not only trigger silent alarms that inform the ship's security complement, but also trigger any number of automated traps. Forced access to most restricted rooms triggers man traps concealed underneath the deck's plate that attempt to immobilize intruders. Key rooms, corridors, and junction points are further guarded by automated Stormfire Repeater emplacements and force-field generators. In terms of electronic protection, the ship utilizes typical pyrowalls and Rapid Repetition Defense Measure programming supervised by dedicated teams of dozens of EI-9 network security droids spread throughout the ship. Shields: The Alpheus is equipped with a pair of Aspis Shield Systems, each of which by itself would provide the ship with almost average shield protection individually. Aspis shield systems use several layers of overlapping shields much like the earlier Mon Calamari cruisers before it. This provides a high amount of protection for a ship its size, and allows the Alpheus to take some local shield generators or projectors offline for repairs during combat while still allowing some shielding to remain online in those some areas. The Alpheus also has several auxiliary Phalanx-class Shield System projectors, which allows the carrier to protect some of its embarked craft in combat via projected shields. Unfortunately, it does not have the power to maintain this shield system along with its other defenses, meaning that typically one of its other shield systems or anti-concussion field generator network has to be powered off in order to be used. The Alpheus also sports the new Aegis II Anti-Concussion Field Generator along with its own dedicated reactor. This makes the Alpheus reasonably resilient against physical threats such as asteroid fields, missile salvos, and mass driver slugs. Sublight Drives: The Alpheus sports banks of Nimble-5 Ion Engines, providing it with typical sublight speed for a vessel of its size during most operations. The engine's boost function can be triggered at times to improve the ship's speed at the loss of maneuverability and shield regeneration. This makes it useful for strategic bursts of speed on the battlefield. Similarly, while the Alpheus typically has poor agility at sublight speeds, it can activate its Gulfstream Maneuvering System to increase its maneuverability at the cost of speed, giving it typical maneuverability for its size. This is typically done when an Alpheus is engaging an opponent in close quarters, allowing it to get in an optimum range to launch boarding assaults. Armament: The Alpheus is fairly lightly armed for its size, relying more on its embarked starfighters and troops to provide most of its offensive capabilities. Nonetheless, it has a mixed armament of homing lasers, turbolasers, plasma railguns, and warhead launchers that typically allow it to fend off light warships like frigates and small cruisers on its own. Similarly, while the Alpheus does have a small number of point defenses for use against enemy warheads and starfighters, it largely relies on its carried starfighters and strong passive defenses to mitigate damage from those threats. Carrying Capacity: As a carrier, the Alpheus unsurprisingly devotes a large amount of internal space to carrying starfighters and other support craft. As with many recent Lucerne Labs designs, the Alpheus accomplishes this by using many small hangar bays spread across the ship. Most of these starfighter hangar bays are only large enough to support a single starfighter squadron, but a single large hangar on both the port and starboard hangar carries up to a wing (3 squadrons) of fighters. These hangars typically are reserved for planned mission strike groups or other priority units, as these hangars also have more amenities to include adjoining conference and planning rooms, rotating munitions storage racks, and hundreds of fully equipped mechanics and other support staff. All starfighter hangars are typically sealed with Argentum Matrix Armor blast doors when not in use and incorporate catapult pressor technology, allowing Alpheus' to rapidly launch its fighter complement into battle. The Alpheus has a single, almost cavernous support craft hangar on its ventral side just behind its midway point. This configuration allows the Alpheus to rapidly launch dozens of dropships in steep dives to take them to planetbound destinations orto temporarily hold corvettes or small frigates. This central location also allows ground units to easily be mustered en mass for deployments. This is not infrequent, as the Alpheus is one of the few ships in the Silver Navy to be able to hold and support an entire old Imperial-style Corps and their equipment and vehicles. Such a large amount of troops is most frequently used to massed battles such as found in invasions or assaulting exceptionally large warships and space stations. These troops or battle droids are typically deployed via support craft, but the Alpheus does have assault tubes with plasma cut boarding devices that can allow them to directly board nearby craft. 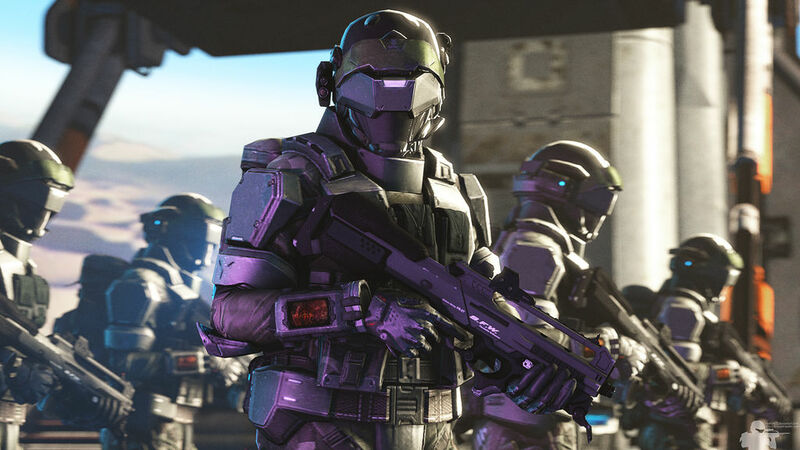 Description: An Antarian Shock Marine Regiment is a standardized group of mixed synthetic soldiers supervised by an organic command staff that has become one of the more common marine components found onboard Silver Jedi-affiliated warships. Shock Marines are characterized by an aggressive relentlessness enabled by their biomechnical origin that allows them to become staunch defenders against enemy boarding attacks and to launcher fierce and even reckless boarding attacks of their own. These tendencies are enabled by equipment carefully chosen for maximum efficiency against likely foes in these encounters. To that end, Shock Marines utilize heavy battle armor with a variety of close-quarter optimized weapons to fight vicious battles in the close confines of starships and other space-going vessels. Shock Marines are not only designed to defeat enemy soldiers, but also to damage and seize enemy starships as well, making them an invaluable asset to the Silver Jedi fleet. Combat Function: Antarian Shock Marines act as spacegoing soldiers on Silver Jedi-aligned starships. Their basic duties mostly consists of providing protection against enemy boarders and providing internal security patrols. However, they are also sometimes employed to board enemy vessels and provide supervision to prisoners captured during these actions. Unsurprisingly, these duties dictate doctrine from the highest to lowest levels of the unit. On a strategic level, most Shock Marine commanders are responsible for protecting either a vessel or a section of one. The highest commander of a Shock Marine contingent consequently is found in the company of the vessel's commander, ready to enact the orders and meet the needs of the vessel's commander. Elements of the Shock Marines are typically dispersed throughout the vessel in a uniform pattern throughout the vessel itself, and are typically responsible for zones within the vessel itself. Consequently, a regiment rarely fights as a concentrated mass, and instead typically fights in much smaller elements, typically at the platoon or squad level. On a squad level, doctrine separates Marines into two fire teams with two different roles. A quartet of riflemen act as a maneuver element, quickly advancing or otherwise maneuvering to quickly take a favorable position for the squad. The second fireteam consists of slower heavy weapon operators, who provide much of the marine's impressive short-range firepower. The squad's sergeant, a Praetorian Synthetic Soldier, who is more well-rounded intellectually and better equipped to interact with the vessel's crew and other inhabitants, provides tactical direction to these elements and stays in constant communication with higher echelons of command thanks to his high-powered communication backpack. Accompanying the commander is an armed technician whose job it is to better alter the environment to the squad's advantage. These alterations may include hacking open doors with his Universal Computer Interface, welding doors and hull breaches shut, jury-rigging circuits, or directing breaching operations. Shock Marines benefit greatly from LPD's philosophy of making adaptable weapons and the battle droids take full advantage of this based on interactions with their foes. If they find that their rifles and assault cannon default modes won't punch through an enemy's defenses, they will simply dial up the power on those weapons to better defeat them. Similarly, these weapons can increase their rate of fire when face with many smaller and/or fast moving foes or when suppression fire is needed. Similarly, the flechette carbines frequently are not only filled with anti-personnel canisters, but often hold anti-vehicle missiles as well for use against heavier enemy battle droids, vehicles, and other static shipboard defenses. But Shock Marines are not only trained to defeat enemy personnel, but enemy vessels themselves. With a basic understanding of spaceflight technology and vessel layouts, Shock Marines frequently will cut through enemy blast doors and bulkheads with their gauntlet mounted laser cutters and then place explosives into those same areas for devastating effects. Void Specialists: Antarian Shock Marines are specially trained and/or programmed to operate in starships, space stations, and other orbital/deep space installations. Antarian Shock Marines are familiar with the general layouts of most vessels as well as basic vessel controls. They also have programming/training to effectively operate in zero-G conditions when the artificial gravity is deactivated. A tech on the squad level can also hastily jury-rig sections of a vessel, help bypass security measures, or sabotage vessel systems. All troops are also capable of cutting through blast doors and bulkheads typically found in starships thanks to the laser cutter built into one of their armor's gauntlets. Aggressive: Antarian Shock Marine footsoldiers are programmed to be exceptionally aggressive and decisive, allowing them to quickly react to situations without fear. This makes them exceptional fighters in cramped conditions where there is not time or terrain to give in order to formulate better plans. Droid Resilience: The vast bulk of an Antarian Shock Marine regiment is composed of battle droids. This makes them more resilient against physical threats such as shrapnel or sudden hull decompression. Droids do also not tire like humans and most organics, which enables them to carry out extended combat with little to no difference in either intellectual or physical performance. Close Quarter Excellence: Antarian Shock Marines are specifically equipped physically and prepared intellectually for close quarters combat commonly found in spacegoing vessels. Physically, this includes the use of heavy personal armor, gauntlet-based energy shields, and close-quartersfocused weaponry. Intellectually, Shock Marines have coordinated close quarter combat drills which are largely optimized by their ability to effortlessly communicate through internal comlinks. This allows squads and their component fire teams to work almost seamlessly as a coordinated element rather than disparate group of individuals. This shows practically in such examples in using coordinated fire assignment vectors to ensure that there are no blindspots, or in using phalanx-style tactics in using overlapping gauntlet-based energy shielding while advancing down corridors towards potential hostiles. Out of place(land): Shock Marines are specialized for space encounters are consequently operate poorly in any land-based environment because of a lack of familiarity and programming. Vegetation, lakes, civilian vehicle traffic, and other such common encounters are not within the synthetic soldier's intellectual understanding, much less tactical programming. Aggressive: Shock Marines' aggressiveness can be a problem, especially as it can lead to them being lured more easily into traps or attacking against superior forces where it intellectually would make more sense to assume a defensive position. This can be somewhat mitigated over the long term by the regiment's organic command chain issuing specific orders to prioritize defense. However, this is typically reactionary order after lower level units (squads, platoons, etc) have acted too aggressively already. Predictable: As effective as the battle droid's programming is, it almost makes them predictable fighters after some experience fighting against them. Basic battle drills rarely change, though as low level Praetorian squad leaders gain experience, a limited amount of deviation from basic programmed tactics slowly makes it way into the squad's operating procedures. Limited Attack Range: With weapons optimized for close-range combat, it comes as little surprise that the same weapons are not very good at extended ranges, which they may encounter in particularly large areas within vessels such as hangar bays, biodomes, and other relatively open environments. The practical realities of a war-wracked galaxy meant that the Silver Jedi Order had to form allied war fleets of their own. With these ships, the need arose to protect them enemy boarding parties and other intruders. To that end, some Silver Jedi warships began to use a motley array of organic marines and battle droids. When Admiral Quee took over the Silver Jedi's 4th Fleet, he began to standardize that element with the creation of the Antarian Shock Marine Regiment by leveraging his connections with Lucerne Labs and Lucerne Personal Defense to create a unit of biomechanical soldiers that blended the advantages of traditional organic-based units with those battle droids. Antarian Shock Marines have since marched out of factories in formations onto the waiting ramps of Silver Jedi starships in spectacles that have reminded many of the Republic clone troopers during the Clone Wars. Elements of these regiments have since found themselves on Silver Jedi starships in all sizes undergoing all sorts of missions, from squads guarding humanitarian supplies on convoy freighters to multiple regiments acting as the spaceborne garrisons of the largest flagships. Picatinny Rail: This rail just to the left of the weapon's midsection allows the Flamestorm to accept a variety of aftermarket scopes, sights, and other attachments. Variable Fire Modes: The Flamestorm can be set to use several different gas and power consumption levels, allowing it to adapt and full different roles as needed. Repulsorlift Generator: The Flamestorm comes with a built-in micro repulsor to make it easier to carry the weapon and move it around. Built-in Bipod: The Flamestorm comes with a bipod that flips down from a compartment under the barrel, allowing it to be more easily used from a stationary position. This can be removed and replaced by tripod for improved stability, but the tripod cannot be retracted. Pivoting Spade Handle: The gun's rear grip can be rotated to point upwards (as shown in the picture) to allow easy from the hip firing, or rotated downwards to better enable prone/stationary firing. Data Uplink: The Flamestorm as a dataport that can allow it to link through a wire or wireless adaptor to HUDs in personal armor, visors, and vehicles. Stun Settings: The Flamestorm does have stun setting in its blaster cannon and repeater modes, which aside from not inflicting regular blaster damage are otherwise identical in terms of performance. Variable Fire Modes: The Flamestorm can alter the intake of its ammunition and firing cycle to allow it to be used in different weapon roles, making it a highly versatile personal heavy weapon. High Rate of Fire (Repeater Mode): The Flamestorm can operate as a standard medium repeating blaster not unlike the Mark II Medium Repeating Blaster, allowing it pour a high volume of fire. This is typically used for fire suppression role, though it also seems some use against groups of small, aerial targets. Magnum Stopping Power (Supercharged Cannon Mode): The Flamestorm can supercharge its bolts in a manner similar to the Hornet Interceptor's supercharged laser cannons, but the practical effects are more like that of BB-23 heavy blaster cannon. The produced bolt is enough to disintegrate sections of duracrete and durasteel or devastate a small number of clustered targets. It is frequently compared to and equivalent to a portable laser cannon, making it exceptionally dangerous to heavily armored battle droids and light vehicles. Bulky: The Flamestorm is a fairly large weapon, making it heavy and difficult to maneuver despite the addition of a microrepulsorlift. Low Stopping Power (Repeater Mode): The individual blaster bolts in repeating mode are fairly weak given the weapon's size, each being roughly equivalent to that of a compact blaster rifle. Slow rate of Fire (Supercharged mode): The supercharged bolts take time to build up full charge to fire, and then the weapon needs some time to cool down once fired, leading to a relatively slow rate of fire in this mode. 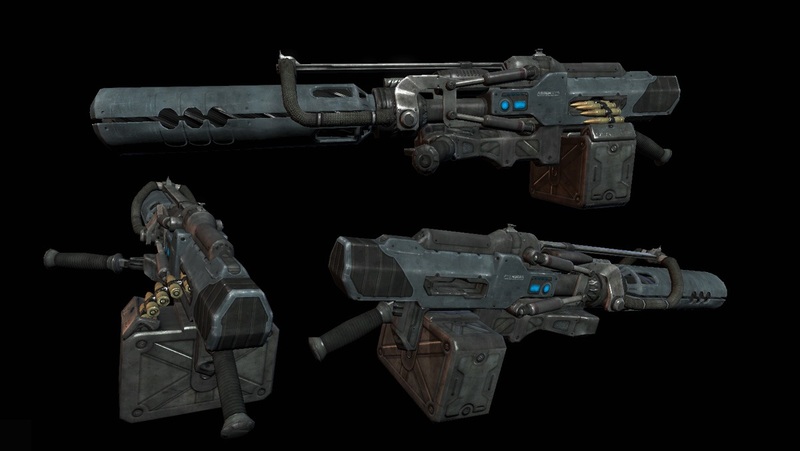 The LPD-27 Flamestorm is Lucerne Personal Defense's take on the assault cannon popularized by Galactic Republic troops during the Cold War. It is a bulky blaster weapon that shares more in common internally with a crew-served repeating blaster rather than a personal weapon. Despite its size and power, the Flamestorm is designed from the ground up to be operated by a single person. This is accomplished by carefully mimicking ergonomic choices from tried and tested assault cannon designs used in the Clone Wars and practically shows in the weapon's excellent balance despite its size by careful placement of its underslung handles. Unlike many of these older designs, the Flamestorm also incorporates a built-in microrepulsorlift, which reduces some of the felt weight. But given the power drain from this feature, it typically is only activated during particularly arduous physical activity such as long marches or during rapid assaults when under enemy fire. Despite its weight, many users find its tactical flexibility in its different fire modes well worth that tradeoff. Blaster Cannon Mode: The Flamestorm acts as a typical personal-scale blaster cannon, sometimes referred to colloquially as an 'assault cannon', with each bolt packing a significantly higher punch, close to that of the classic E-Web's bolt.This is typically enough to cut through armored soldiers and significantly damage light vehicles such as speeder bikes and small walkers. With sustained fire, it can even damage small starships and aerial vehicles. Repeater Mode: The Flamestorm focuses on obtaining a high rate of fire at the loss of individual bolt damage and cohesion. Individual bolts are typically as powerful as those of a blaster rifle. This typically makes it useful as a fire suppression weapon, and oftentimes fulfills a role classically filled by slugthrower machine guns. Because of its portable nature, however, the Flamestorm notably lacks an extended ammunition supply. This means that it is best used in burst capacity, or only as a temporary means of suppression fire. Supercharged Mode: The Flamestorm focuses on producing massive blaster bolts with impressive power. In this mode, the Flamestorm's bolts can sometimes outright disintegrate person-sized targets and becomes a significant threat to many enemy vehicles. Bolts in this mode often produce a small blast radius of a meter or two, which means it highly effective against clustered together infantry and other lightly protected targets. Unfortunately, this power comes at the cost of a slow recharge time and a greatly reduced ammunition capacity. Flamestorms are typically issued as squad level support weapons, often acting as alternative to repeating blasters, especially in highly mobile groups such as scouts and light infantry. They also frequently are found in the hands of short-range shock troops, such as shipboard marines and urban combat specialists. The weapons are also large and ergonomic enough that wookiees and other larger species have little trouble using them as basic personal weapons. Because of the potential power of these weapons and the local legalities of possessing such weapons, the vast majority of Flamestorms are in government and company hands, rather than individual users.